Guidance and Control focuses on space guidance models and behavior control techniques needed in space missions. Divided into eight parts with 30 chapters, the book contains the literature of authors who have conducted extensive research on factors affecting space missions. The concerns include ascent from Earth to an orbit requiring navigation as well as descent to Earth or the moon; the system aspects of inertial navigation; and developments in modern control theory and attitude control. 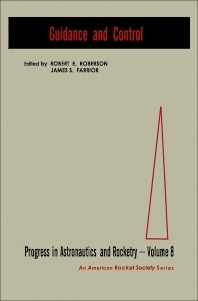 The text looks at experiments on the launch of space missions and the different mathematical techniques used to measure the movement of a variable-mass vehicle. The selection also notes the processes and techniques involved in keeping satellites in compatible orbits; the influence of calculus of perturbations as applied to lunar mission analysis; and tracking of space vehicles through satellites and radar. The book also presents guidance systems for soft lunar landing and the longitudinal control of a lifting vehicle entering a planetary atmosphere. Other concerns include the application of sideband folding techniques to navigation satellite system; Damping an inertial navigation system; and application of multiple inertial system in navigation. The text ends by highlighting the use of gyroscopes in space navigation and infrared navigation sensors in space vehicles and how solar radiation affects pressure on satellite attitude control. The book is valuable for readers interested in studying the factors involved in space missions.